Is Washington, D.C. the burger capital of the United States? Some have suggested it is, and I can certainly see why. Burgers of all flavors and pedigree can be found in all quarters of the city, ranging from nostalgic burger-n-shake joints to refined gourmet offerings. With all this competition, there's no excuse for a bad burger. But who's making the best burger? 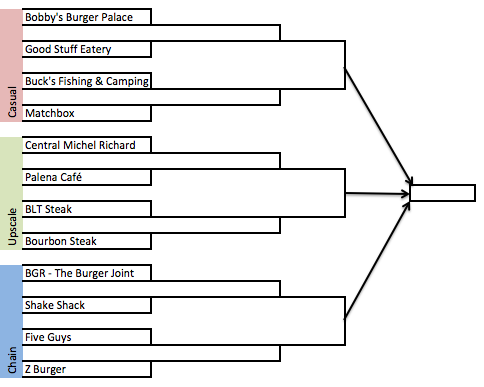 That's what I'm seeking to find this month with Burger Madness, a March Madness-style bracket tournament. On the basis of my own knowledge and research into what burgers people are talking about, I selected 12 restaurants for this competition. To put some parameters on it (I can only eat so many burgers), I decided to limit it to the city proper. So no Ray's Hell Burger (which I've heard is excellent). I also decided not to include the national mass-market chains (a.k.a. McDonald's and Burger King), since I doubt they would last long in the competition. I'm looking for burgers that excel in delivering flavor and fresh ingredients. At each restaurant, I ordered the standard burger with cheese. If a cheese option was provided, I generally chose cheddar (but not always). I wasn't so consistent about bacon, but generally if it was available I had that too. If a cooking option was provided, I asked the restaurant for its recommendation. As far as condiments go, I went with whatever was standard, adding sauce at the table only if it wasn't already on the burger. In judging the burgers, I assessed attributes such as overall flavor and flavor of specific components, especially the patty (is it meaty? well-seasoned? not too salty? grill-flavored? ), bacon and cheese. I examined how well the condiments worked to add flavors without overpowering the meat. I assessed the structure and flavor of the bun: does it hold the sandwich together effectively? I took note of anything that made a burger special. Accompaniments such a fries and shakes will not be considered in the judging. I divided the restaurants, somewhat arbitrarily, into three divisions: upscale restaurants (i.e. fine dining establishments that generally serve many things other than burgers), casual restaurants (a mix of service styles but generally more than just a fast-food place) and chain restaurants (multi-location, fast service restaurants that specialize in burgers). I'm going to start this week with the casual division, proceed next week to upscale and then chain before the finals at the end of the month. Let's go! If I still fit into my pants at the end of this project, it'll be a miracle. Tell me about it. We won't be hungry for burgers for awhile.